In the African-American culture, Kwanzaa is a holiday that honors tradition and deepens children’s understanding of their heritage. It’s also a lot of fun—seven days of food, music, dancing, creativity, and other family activities. Kwanzaa (also spelled Kwanza) was founded in 1966 as a way to celebrate African-American heritage, community, family, justice, and nature. It’s not a religious holiday; it’s a celebration of unity and ancestry. A central symbol of Kwanzaa is the kinara, a candelabra that holds one black, three red, and three green candles. The kinara is placed under a straw mat (called a mkeka) during Kwanzaa, and the candles are lighted in a particular order until the final day when all seven candles are burned. Another Kwanzaa symbol is corn. One ear of corn is placed under the kinara to symbolize each child in a family. Traditionally, a feast is held on day six of Kwanzaa and gifts are exchanged on day seven. The feast, which falls on December 31, is called karamu. Since it corresponds with the day that honors creativity (kuumba), many families organize a craft-making party. Then, the crafts are exchanged as gifts on January 1. The crafts should somehow tie to the African-American heritage or to Kwanzaa itself. Kids could make corn necklaces, woven placemats, family history books or homemade kinaras. Before the feast, decorate your house in the colors of Kwanzaa (red, green and black) either using conventional party supplies, such as streamers or with symbols from black cultures, such as the African-American flag. You could also use items from nature or, if your family also celebrates Christmas, consider decorating your tree with red, green, and black ornaments and lights. For other activities during the party, teach the children traditional African games, such as Kalah, or play Kwanzaa music and encourage everyone to dance. Since Karamu is a feast, after all, prepare a spread of traditional African-American foods. Involve the children in the meal prep, and they’ll feel a sense of pride for contributing to the dinner. If you’re looking for favors to give the children after the feast or as gifts on Kwanzaa’s final day, consider books about the holiday. 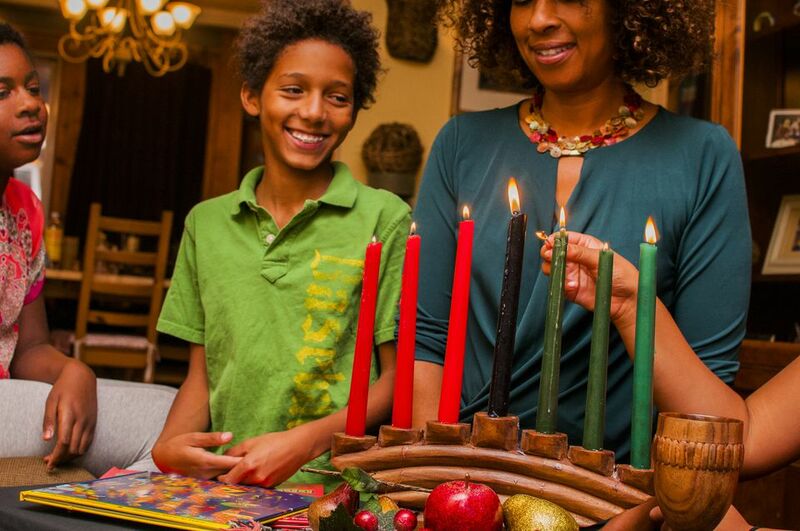 Kwanzaa is a meaningful way to wrap up the year and reflect on important values. It’s also a chance to start the New Year with a sense of purpose, responsibility, self-respect, and care for the community.